For the EPOS2 Module 36/2 positioning controller, maxon motor offers a motherboard that can be applied with just a few simple steps to suit drive systems with up to 11 axes. In respect to flexibility and modular design, the EPOS2 Module Motherboard is hard to beat. Whether for experimental purposes or in series production, the motherboard is the cost-effective, ready-to-use solution for multi-axis applications. The EPOS motor controller family comprises supremely efficient, highly dynamic positioning controllers to operate brushed and brushless DC motors (DC and BLDC). They are designed to extremely efficiently and accurately fulfill most complex positioning tasks. EPOS controllers feature comprehensive functionality and can be put into operation in the simplest way. The EPOS2 Module 36/2 is designed as plug-in module for OEM system integration. 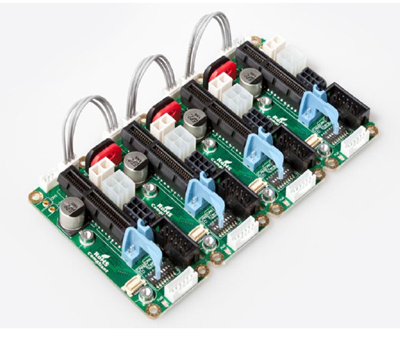 For rapid, uncomplicated product development and to facilitate the customer’s motherboard design, maxon motor already offers a starter kit with evaluation board for single axis systems.